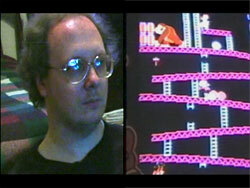 January 1st, 2013 - I try to keep "meta-blogging" to a minimum, and we'll get back to Donkey Kong shortly, but there's now a build-up of matters that need to be addressed. The last update to this blog came a couple of days before Thanksgiving (over a month ago). In it, I implied that I'd be back within a few days, but... well... here we are. I realized a few days after stepping away from the blog, once I'd had a chance to take a deep breath, that I needed to stay away for a while. 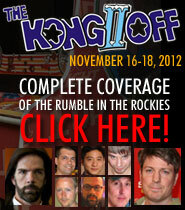 The Kong Off 2 coverage ended up being more of an undertaking than I'd anticipated. I work on this blog for fun, as a guilty pleasure, but it was beginning to chew up a disturbing and irresponsible proportion of my time and mental energy. It was starting to feel like work. It was time to take a break and work on other things. This wasn't the first time that I've left Donkey Blog untouched for a long stretch of time, and (just as a heads-up) it will not be the last! I'm involved in about eighteen dozen projects and I tend to work on each in obsessive, concentrated bursts, as opposed to a steady drip. I'm going to use this opportunity to make a suggestion: if you see this blog go dark for an extended period, don't be afraid to ask for updates. I won't take offense. Indeed, the only way for me to know you want more is if you ask for it. At the end of the last update, I mentioned that I would be returning to discuss a decision that I had made "in response to current events." I have since reversed that decision. But since I'd already put myself on the spot, I'm obligated to at least tell you what it was! 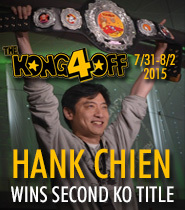 The new ownership of Twin Galaxies announced at the Kong Off 2 that taped submissions for non-world record scores would no longer be accepted. This would have crippled, and had the potential to kill, competition on the Donkey Kong scoreboards. I believe that anyone who wants to see their name on the scoreboard, regardless of place, should have that opportunity. Different gamers have different motivations, and not all of them are gunning for first place. Some are happy to be in 2nd, or 9th, or even 50th. This is true for Donkey Kong in particular: competition at this game has reached a level where even twentieth place is a significant achievement, and cracking the top ten takes serious dedication to the craft. If Twin Galaxies was no longer interested in tracking any score other than the record, I felt that someone ought to pick up the torch. 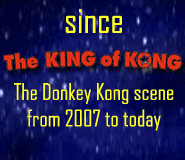 My proposal, therefore, was to found a new, community-run scoreboard, devoted specifically to Donkey Kong, which would incorporate and aggregate all existing Donkey Kong scores—whether verified by Twin Galaxies, Aurcade, MAME Action Replay, or any other reputed entity—as well as accept, review, and verify new submissions. Soon after Thanksgiving, I revealed the idea during one of Dean Saglio's live streams. Several top players on the stream at the time (including Vincent Lemay, Mitchell Elliott and Dean himself) expressed support for the idea. However, a major development ensued. In a move that came as both a surprise and a relief to many in the gaming community, Twin Galaxies announced on their Facebook page that they had reversed their "world records only" decision (along with several others announced at the Kong Off), and that they would continue to accept all submissions. In other words, the problem that I was stepping forward to solve ended up solving itself! I have, for this reason and others, decided not to move forward with my idea. Those of you following the Kong Off 2 coverage here may remember the update I posted just after Twin Galaxies' Arcade Culture stream, where I voiced a few harsh words in reaction to what I had just heard. At this point, most of us know and love Richie Knucklez, myself among them, and feel just fine about him being one of the new co-owners of Twin Galaxies. Jourdan Adler, however, is someone the community doesn't know as well, and is to most of us still a stranger. What I heard on the stream made me wary, to put it mildly. But with his response to the feedback generated by the policy changes (namely, to take action on those that were unpopular), Jourdan has since made something very clear: that he is listening. That's really all I needed to hear. I now have renewed confidence in Twin Galaxies, and in Jourdan himself, and am looking forward to seeing what the future brings. 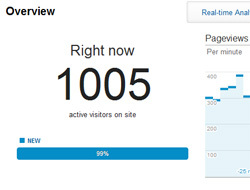 If you happen to pay any attention to this blog's pageview counter, you might have noticed that the number has exploded. The total was less than 60,000 before Christmas. It's now over 200,000. Several of you are curious as to what the heck happened. Long story short: Eminem's Donkey Kong Ambitions got "frontpaged" on Reddit. On the morning of December 25th, A Redditor linked to the story from the "Today I Learned..." sub-Reddit. One thing led to another, and by 3:00 PM—based on the comments, votes, and general amount of attention that the article was receiving—the link had managed to climb its way to Reddit's main frontpage. As a result of that feat (and the inevitable Tweets, re-Tweets, re-blogs, and shares that came with it), Donkey Blog received nearly 100,000 visitors over the next 48 hours, with a steady trickle of residual traffic that continues to this moment. More exciting to me personally than the Reddit event itself was the link and the kind words from überblogger Jason Kottke, whose work I enjoy and respect. How strange for an old story (that was already old even when I wrote about it) to suddenly wake up and go flying! But while it was a fun and surreal moment when I checked my realtime traffic monitor at the height of the surge on Christmas Day to see over a thousand readers on the blog simultaneously, I knew that it wasn't anything to get too terribly excited about. I've been making websites and blogs for 15 years. Let's just say that this isn't my first "flash crowd." I learned a long time ago that a traffic-bomb, especially on a blog like this one, generally doesn't have much of an effect in the long term (or even in the short term). A few numbers should speak for themselves in that regard: out of all of those tens of thousands of visitors, I got a grand total of 2 comments and 3 new subscribers to the Facebook page. In other words, they came, they peeked, and then they went back to looking at pictures of cats. Not that there's anything wrong with that, but in the end, it changes nothing. 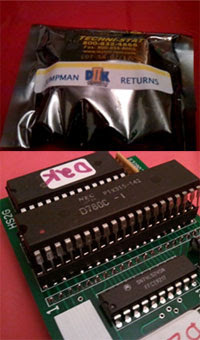 The content on this blog is designed to garner casual outsider interest while simultaneously satisfying the DK faithful. The fact of the matter is that the potential size of the "core readership" is small... and just about everybody in that group is already present and accounted for! Nonetheless, this past week's guests were more than welcome to stop by and take a look, and I was happy to see them. I've decided that it's never too late to recap the Kong Off 2 (especially since I'm more than halfway done with my write-up), so that will be along in due time. Hank Chien has prepared a draft of answers to questions about Donkey Kong that he gets asked too often. I'll be looking at this more deeply and posting it soon. Vincent Lemay is in Denver at this very moment and will be kicking off a multi-day attempt at the Donkey Kong world record from The 1up, beginning just a few hours from now. Rumor has it that the event will be streamed. I will post a quick story tomorrow if this stream does indeed come together (followed by a bigger story if and when he succeeds!) Good luck, Vincent. Finally, I wanted to mention that I recently secured the top MARP ranking on the MAME version of Donkey Kong II: Jumpman Returns (which I consider to be the greatest "homebrew" video game hack ever made). I know Ben Falls can beat the score, to say nothing of Dean Saglio, Eric Akeson, and others, but what the heck, after a year of off-and-on play, I'm proud. 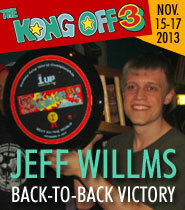 In the wake of this achievement I acquired the arcade hardware and it is now installed in my Donkey Kong machine. I'm ready to do some damage! See you all (hopefully) soon. D2K is a nightmare, 256K is a good score.